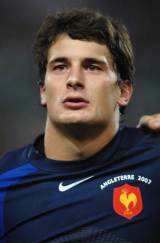 Inspirational French centre Yannick Jauzion made his international debut in France's 32-23 victory over South Africa in Johannesburg in June 2001. A product of Colomiers' late 90s success, he forged a reputation as one of the finest centres in world rugby thanks to his winning combination of flair, pace and strength. Having moved to French giants Toulouse in 2002, he collected a Heineken Cup winner's medal in his first season at the club. Despite missing out on the 2002 French Grand Slam, Jauzion gained a place in the squad for the 2003 Six Nations. France were unable to repeat their achievement, losing to champions England in their first game. Jauzion's five appearances were enough to secure him a place on the plane to Australia for the 2003 World Cup. After scoring a hat trick of tries in France's opening game against Fiji, he started four of six matches and forged a strong partnership in the centre with Tony Marsh. Following a defeat to England in the semi final, Jauzion and France bounced back by winning a Grand Slam in the 2004 Six Nations. He started all of France's matches, scoring in the opener against Ireland and adding a brace in a 31-0 victory over Scotland at Murrayfield. He found himself behind Brian Liebenberg in the pecking order for the first two fixtures of the 2005 Six Nations, including a victory over England at Twickenham. He returned for the fixture against Wales at the Stade De France, but was unable to stop France slipping to their only loss of the championship. Back at club level, Jauzion and Toulouse were able to secure another Heineken Cup victory in 2005 with victory over perennial rivals Stade Francais at Murrayfield. Jauzion lit up the grandest stage in European club rugby with a man of the match performance. With injury ruling him out of the 2006 Six Nations, it was not until the French championship success in 2007 that he was able to regain his place in the international setup. He won a place in the 2007 French World Cup squad, and scored a controversial match-winning try against New Zealand in the quarter finals before England ended French hopes. He then suffered an alarming dip in form, culminating in a disappointing Six Nations in which new French coach Marc Lievremont chose to rotate his squad. Jauzion's only appearances against Wales and Italy. The 2009-10 season heralded a stunning return to his very best form, Jauzion inspiring France to a Grand Slam triumph before playing an integral role in Toulouse landing an unprecedented fourth Heineken Cup. The following season Toulouse crashed out of the Heineken Cup but went on to secure French Top 14 title. The ageing Jauzion dropped out of the international picture and missed out on France's World Cup campaign. However he continued to perform for Toulouse and signed a new contract with the club in December 2011, retiring at the end of the 2012-13 campaign.